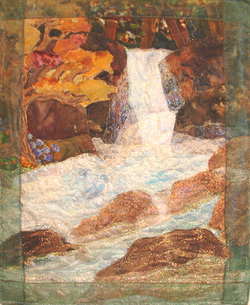 In this class, you will make a small wallhanging that represents the Earth, with rocks and trees, flowers and flowing water; a small, secret place in the world that is your own, private retreat.I will provide a pattern for this piece, but also be thinking of your own, personal, private, landscapes that you will be able to make after taking this class. The point of a class, to my mind, is to take away tools and techniques that you can then apply to your own projects in your own, inimitable fashion. Every piece you make should be created with the breath of your own spirit. The supply fee includes: 2 patterns, a multiple page handout; Lutradur; iridescent cracked ice; Puff Painted tree and rocks; MistyFuse; cellophane; Angelina fiber, roving; Tyvek; and Totally Stable, and will bring fabric paints, Shiva Paintstiks, some sheer fabrics, metallic paint powders, heat gun and wood burning tool for use as necessary. Materials fee: $20 per student, payable to me at the beginning of class. Note to Workshop Chair: We will need approximately 5 irons/ironing surfaces for the class, and each student will need about half a table, and we will need some electricity for various sorts of melting tools. We will need two extra tables for painting/drying things, and plastic tarps would be great if you need to protect rugs and/or floors. Fabrics for the Earth scene – for tree leaves, tree trunks, rocks, water, preferably batiks or blurry hand dyes, NOT calicos! Also one fabric with small clumps of flowers you can fuse in for greenery in the scene. Taper candle, candle holder, matches, pie tin. Sewing machine - You can just pin everything and take it home to sew, or sew it down at the end of class if you are a fast worker. If you want to sew, bring standard sewing machine stuff – machine, foot pedal, power cord, open toe and darning foot, extension cord and plug strip, as well as YLI invisible thread. Cushion to sit on and a light. Might as well be comfortable!